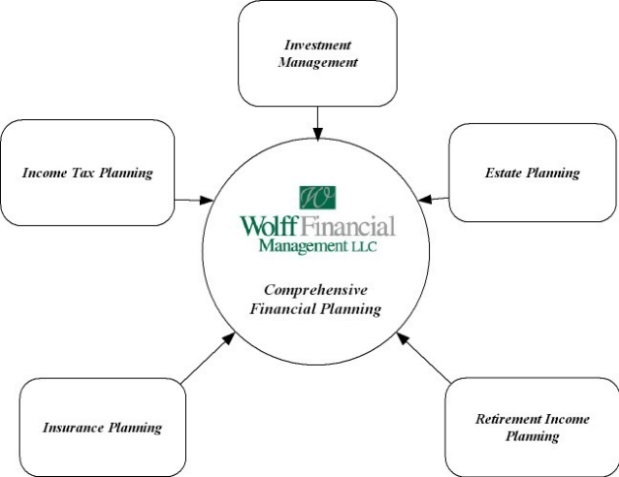 Wolff Financial Management LLC was established in 1994 to satisfy the needs of clients for a practical, integrated approach to financial planning and investment management. Previous experience in trust administration and investment management, as well as tax planning, provided vast experience from multiple professional planning viewpoints giving Matt Wolff the idea of creating a valuable, unique, comprehensive planning approach. We provide independent, comprehensive wealth management services based on helping you make the right decisions to help achieve your financial goals now, and throughout retirement. We specialize in planning for retirement, investment management, estate and income taxes. We have access to a strong network of independent professionals, which assist our firm with implementing planning ideas for our clients. Our independent planning processes are founded on strong principles, values, beliefs, and integrity. We are completely objective and unbiased in the advice we give our clients. Our only source of compensation is the fees paid to us by our clients, and all fees are fully disclosed. We believe in keeping our clients well informed and focused on the big picture and their goals. We have enormous respect for our clients and take our responsibility of planning, implementing, and reviewing their financial plans very seriously. We believe in long-term planning and investing for specific goals and needs. We invest; we don’t speculate, and we don’t chase hunches or current fads based on the evening news report or your brother-in-laws cousin who does a lot of investing. We explain the various investment risks associated with different types of investments. We search for quality investments among a large database of investment opportunities. We review these investments to measure whether their objectives, in coordination with our client’s goals, are being met.